The #FolkloreThursday Twitter feed has been full the last few weeks of all things Krampus. This makes sense, given that December 5 was the eve of St. Nicholas Day, and the holiday devil is associated with that good saint. 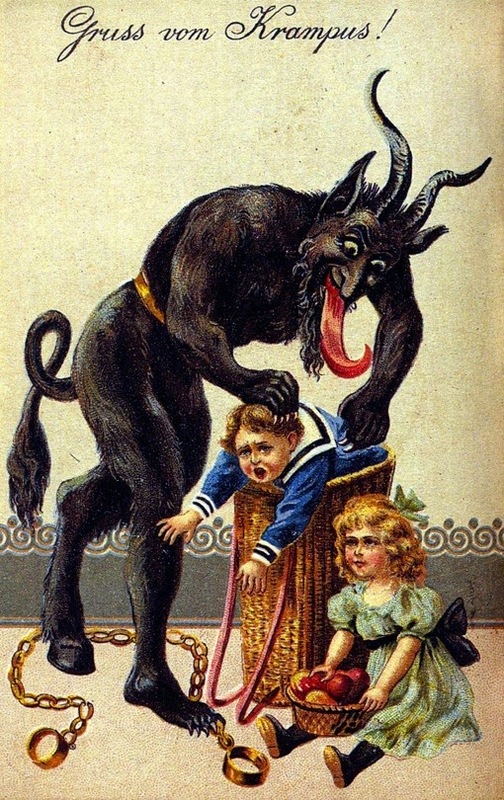 St. Nicholas gives gifts to good children; Krampus punishes the ones who misbehave. Good cop, bad cop was around long before it was a trope on the screen. I have a particular interest in Krampus this year because I’ve been invited to participate in a storytelling on December 19 at St. Mark’s Episcopal Cathedral that will involve him. They’re calling the event “Episco-Dazzle,” in contrast to the Holidazzle Parade. This annual Minneapolis event usually marches down the Nicollet Avenue Mall and encourages downtown shopping. Due to construction, Holidazzle is taking place in Loring Park this year, directly across from the Cathedral. The good folks at St. Mark’s saw an opportunity to open their doors and welcome the community. And perhaps do a little something countercultural, or at least counter-commercialism. Krampus is growing in popularity in the states, partly as an antidote to scholocky, over consumerist Christmas. There was an excellent article about the many monsters of European Christmas on “Why America Doesn’t Have Christmas Monsters.” In it, Caitlin Hu digests for us Stephen Nissenbaum’s Pulitzer-prize nominated book, The Battle for Christmas, a carefully researched study of how a group of prominent New Yorkers created the St. Nick which became our Santa Claus to domesticate what used to be a drunken brawl of a holiday. This didn’t happen across the pond, so they still have the monsters we are now rediscovering, including the cowbell-slinging Krampus. Krampus used to be common on greeting cards of the season. 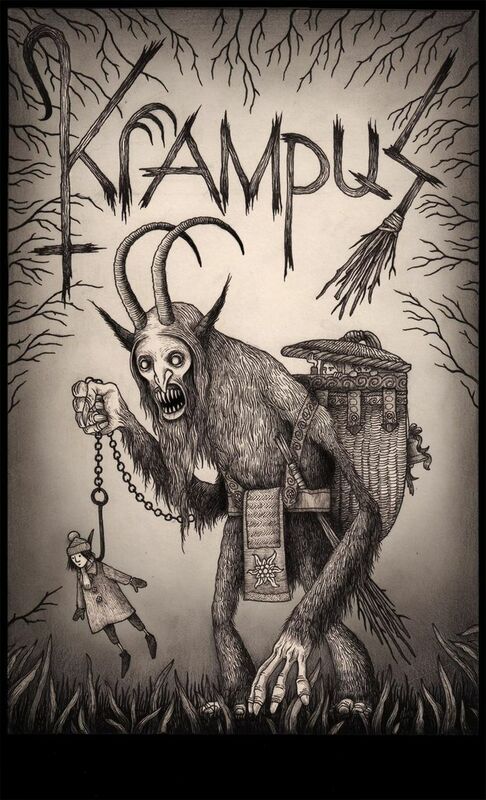 H. J. Blenkinsop has a nice post on her blog about Krampus with a few links to sources. It features the above card. A book of such cards by Monte Beauchamp, Krampus the Devil of Christmas, published in 2010, increased his popularity today. [Correction: Mr. Beauchamp’s comment (below) indicates his first Krampus book was published in 2004, and emerged from previous work in comics.] Paranormal author Joni Mayhan has quite a few more examples of such artwork on her blog. Though I did not find it on the #FolkloreThursday thread, it should be noted that Krampus has an entire web site dedicated to him which features a gallery of such images, as well as a history and list of events. You can even send e-cards. K. A. Laity, noting that she was into Krampus “before Krampus was cool,” offered up a digital chapbook, When Little Joe the Krampus Met. Not only is it available in print, but you can hear her read it too, with a nice, jazzy musical accompaniment. I liked it because in it (spoiler alert) the kid gets the best of the encounter. I listened to a good Krampus podcast as well. Though I still have absolutely no idea what “family holiday stories” I will be telling at Episco-Dazzle. Let’s hear it for research as procrastination! A review of Michael Doherty’s horror comedy Krampus, which had its debut December 4, was shared. It is written not by a movie critic but by Al Ridenour who, along with founder Al Guerrero, produces the LA Krampusfest, and has a book on Krampus forthcoming. A horror fan “since the age of ten,” he nevertheless was deeply disappointed in the movie, for reasons people attracted to myth and folklore will appreciate. I don’t think I will be tempted. This, on the other hand, I enjoyed. Below is another artist’s interpretation of the Krampus legend that was hardly authentic (as far as I am aware, at least) but certainly interesting: a shadow puppet play about a Krampus that steals a hard-hearted man’s wife. After all the American celebration of the Krampus as a corrective to shlock and sentimentality, perhaps we need a corrective to the corrective. That’s a pretty good question. Our Krampus, however, is going to be served with carols and cocoa. I suspect that will mellow the bacchanal. Still…I better start thinking about those stories. Krampus at Perchtenlauf Klagenfurt. Courtesy Wikimedia Commons. 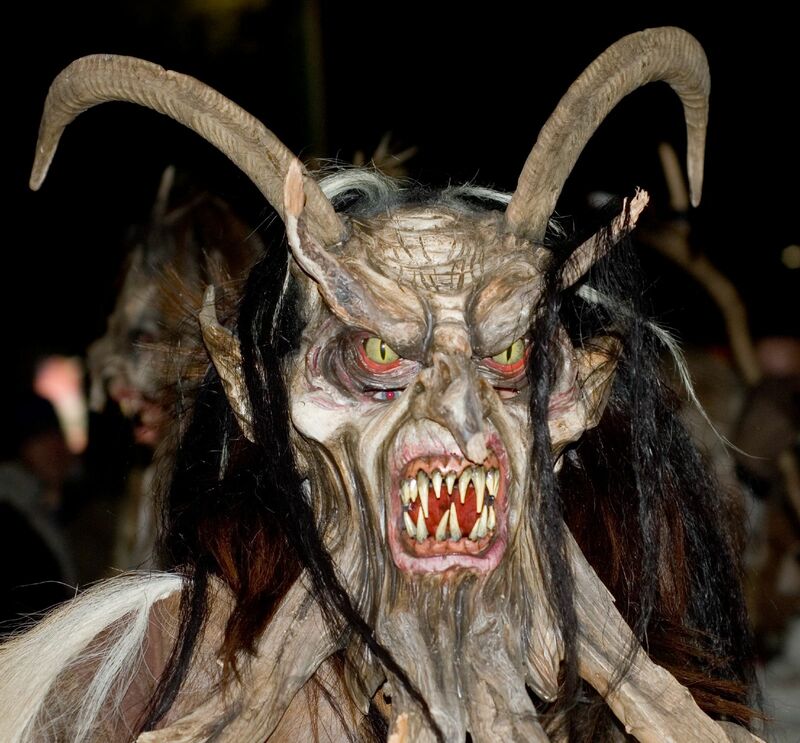 I heard of the Krampus while living in a small town in Germany – seemed frightening to me particularly on those cold dark days that Germany is famous for. Though it seemed to me the children were more amused by him – kind of a buffoon monster. That’s my favorite kind of monster. How wonderful to hear from someone who actually experienced this tradition. Apparently it did not work in the way it was intended. ;-) One of the monsters I came across in this research was The Belsnickel, who does something closer to what you do with your children – distributes sticks and sweets chaotically. I rather like the symbolism of that; it is more like reality, and less like a judgment. I recognised the word Krampus but didn’t know much about it – thanks for sharing. I like the idea that we swing from schmaltz to terrorising and hopefully we’ll find something in between. Hope your event goes well. Thanks, Anne. A friend shared a video on Facebook of a Krampus Parade. They all rather look like big Chewbaccas with horns. The cowbells on their backsides make them look rather like baboons. I guess there is some therapeutic value to tamed monsters in daylight walking down the main drag, and clearly in tow of the Radiant Ones. Thanks for educating me. Sticks are much neater than hunks of coal. Krampus reminds me of the Italian buffoon monster that my husband pronounced Stratcibidatch. But I can’t find anything even close to that spelling on google, so maybe it was all in his head. We created wonderful stories of the monster’s adventures. He usually ended up on the bad end of things, such as breaking into the ice cream store and eating so much ice cream that he couldn’t get out the door–and so was caught in the act. It’s more than a little challenging for me to deal with commercial Christmas hype, so I feel Krampus within. Congratulations on your upcoming storytelling. Sounds like a wonderful gig. “Krampus, the Devil of Christmas” (Last Gasp Books, 2010) is actually a revised and expanded version of my first book “The Devil in Design: The Krampus Postcards” published in 2004 by Fantagraphic Books—which in turn was an assemblage of two hefty features on Krampus postcards that I ran in issue #11 (2000) and #12 (2001) in my art-illustration-comics anthology BLAB! (also published by Fantagraphics). Once that first book entered the mainstream, I began getting requests to license imagery from it from tv shows such as The Supernatural, Anthony Bourdain, and NCIS for their Christmas specials featuring the character. So that’s how the phenomenon of Krampus in America essentially got started. Thank you! That’s very interesting! I will correct the book information. Please let me know if there is I am incorrectly attributing the postcard here; I found it on many different sites. And thank you for stopping by! My pleasure, Paula. If you would like to feature any additional cards from my book along with the one that you have, I will be happy to forward you a few images. Happy Holidaze. Yikes! As if the lurking wolves and wild turkeys weren’t frightening enough on a cold winter day. Interesting that such a character or myth would be gaining popularity. Are we that unsettled or does someone need a stick for the holidays?